﻿ Here are the various recipes I developed for this year's Rosh Hashanah celebration. For more on Blog Appetit's Rosh Hashanah 5772 coverage, please click here. 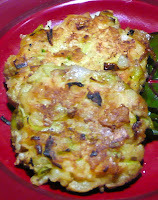 Many of these recipes have appeared in the j weekly, the San Francisco Bay area's Jewish newsweekly. 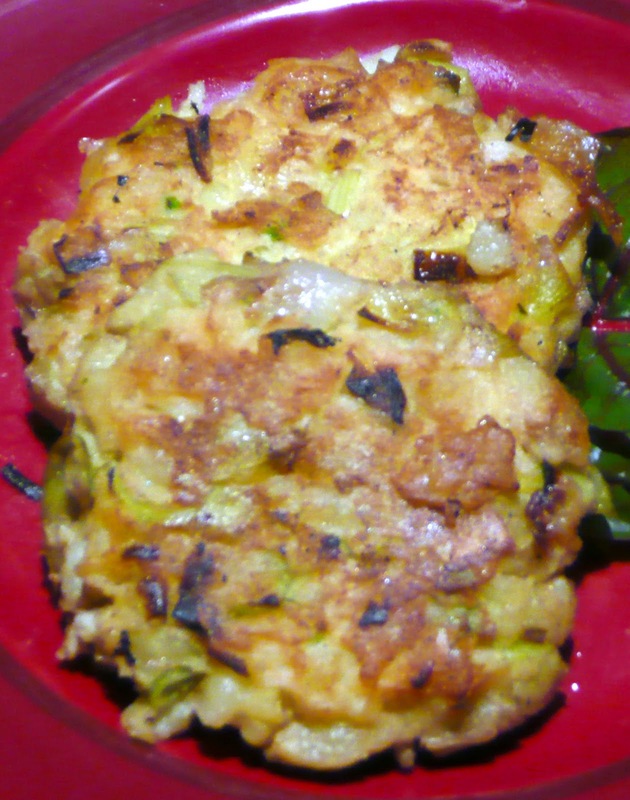 These savory pancakes make a good starter course (perhaps served with a smear of Sriracha or other chili paste sauce and or a dab of mango chutney) or a wonderful accompaniment to roast chicken, pot roast or other main course. Leeks are included in the Rosh Hashanah Seder because their name in Hebrew is similar to the word for cut off and symbolizes defeating our enemies. Boil the potatoes in lightly salted water until tender. Cool. Peel if desired. Mash or rice until smooth. A sweet tzimmes with carrots is a traditional dish. Carrots are symbolic of prosperity. The sweetness is a reminder of the wish to have a sweet New Year. This tzimmes is lighter in color and not as sweet or heavy. Serve over noodles or potatoes. Cover apricots and prunes with boiling water. Let steep until softened (about 20 minutes depending on fruit). Drain, reserving liquid. Cut chicken into 1 1/2” chunks. Add oil to large Dutch oven or other heavy pot over medium high heat. Brown chicken chunks, working in batches if necessary. Remove from pan and reserve. Add onions, put heat on medium low and cook, stirring occasionally until softened, well browned and caramelized about 25 minutes. Raise heat to medium high, add garlic and sauté until golden. Add red pepper flakes, salt, black pepper, cumin, carrots, soy sauce, apricots, prunes, and reserved soaking water and stir well, incorporating any browned bits from the bottom of the pan. Bring to a simmer. Add chicken pieces and any accumulated juices. Stir well. Cover and keep at a simmer, stirring occasionally until chicken and carrots are cooked through (about 30 minutes). Taste and correct seasoning. For thicker sauce, remove solids and keep warm and raise heat under sauce and cook uncovered until reduced. This dish is packed with tasty Rosh Hashanah symbols – chard which represents our asking that our enemies be removed, green beans which have come to mean a wish that God will increase our merits and more. It can also be made ahead and reheated just before serving. Heat the 2 Tbs. of oil in a large fry or sauté pan over medium high heat. Add 1/2 cup onion and 1/2 Tbs. garlic, 1/8 tsp. of red pepper flakes, 1/4 tsp. of salt and 1/4 tsp of ground black pepper. Sauté until golden. Add chicken thighs, browning on both sides and cooking until almost cooked through, about 7 minutes. Remove from pan with juices and any brown bits. Set aside, covering with foil to keep warm. Add remaining oil to pan if needed. Heat over medium high heat. Add remaining onions, garlic, red pepper, salt, black pepper, the ginger and turmeric. Sauté about 2 minutes until onions are softened and golden. Add zucchini. Sauté for 2 minutes, add green beans, sauté 2 minutes. Stir in chard, sauté for a minute then add chicken broth, stirring up any browned bits from the bottom of the pan. Add cherry tomatoes, stir well and sauté, stirring occasionally until the chard is softened and the liquid is somewhat reduced, about 10 minutes. Taste and correct seasoning, adding sugar if the greens are too bitter. 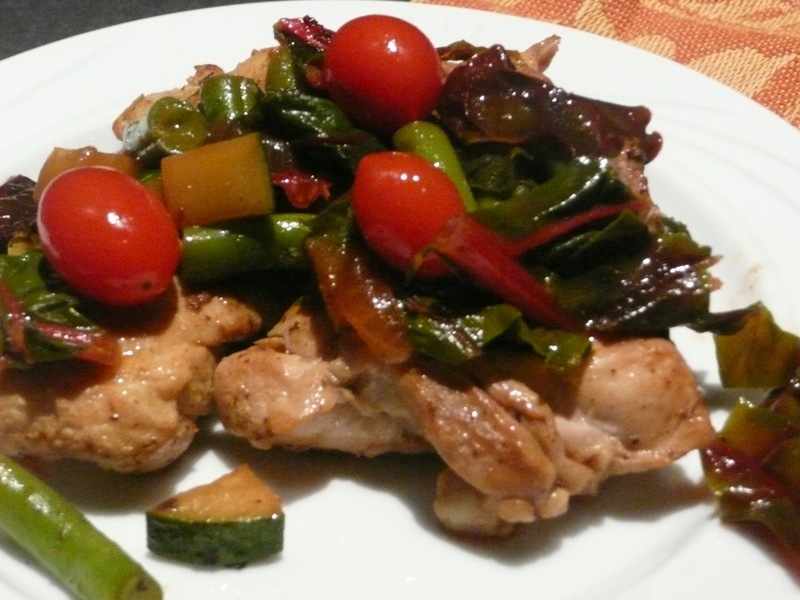 Return chicken, juices and cooked onion mixture to pan with vegetables. Stir well. Cook until chicken is thoroughly reheated and cooked through. Serve over rice or couscous. To Make Ahead and Reheat. Don’t cover the cooked thighs with foil. Store the cooked vegetables and chicken separately in the refrigerator. Allow to come to room temperature before reheating. Preheat oven to 350 degrees. Place vegetables in baking dish. Place chicken on top of vegetables. Spoon any juices and cooked onion mixture over the chicken. Cover with foil. Cook for about 30-50 minutes until thoroughly reheated and chicken is cooked through. Black-eyed peas are an important part of Sephardic and North African Rosh Hashanah tradition, symbolic of our wish that God multiply our merits. If using canned black-eyed peas, no need to cook them, but be sure to rinse and drain them well. Combine the carrots, celery, scallions, red bell pepper, black-eyed peas and lemon zest. Mix. Make the dressing in a separate bowl, combining juice, oil, salt and siracha. Mix well. Stir into vegetables. Taste and correct seasonings. The salad should not taste “hot” but should have a slight zing. Serve at room temperature. Round foods are symbolic of wholeness and continuity. Parve foods contain neither meat nor dairy. This recipe is also vegan. Simmer soy milk over medium heat. Add margarine, stirring until dissolved. Stir in cinnamon and almond extract. Reduce heat to very low. Add chocolate, stirring constantly until thoroughly melted. Refrigerate covered for several hours until the mixture is solid but pliable (it may be a bit crumbly). Oil hands and measuring spoon if desired. Spoon out about 2 tsp. of the chocolate mixture and using hands and fingers press or pinch into a rough round. Roll in cocoa powder if desired. Repeat. Store covered in refrigerator and take out about 20 minutes before serving. This parve tart features pumpkins and dates, both foods mentioned in the Talmud as part of the Rosh Hashanah food celebration. Pumpkins symbolize our good deeds being called out as well as the plea for any harsh judgments to be torn up and disregarded. Dates symbolize an end to hostility or ill will. 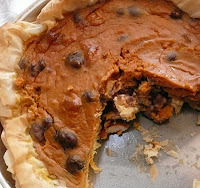 If you are using canned pumpkin puree, be sure you are not using the pre-spiced pumpkin pie filling mix. In a large bowl combine the pumpkin puree, eggs, juice, sugars, cinnamon and ginger. Mix well. Add the dates and walnuts and stir until evenly dispersed through filling. Set aside. Make the filo crust. Have ready a package of defrosted filo leaves. Set seven aside covered with a damp paper towel. Repackage and refreeze remainder. Brush the bottom and sides of a 9” round cake pan with vegetable oil. Take out one filo sheet (leaving others covered). Center in the cake pan and brush surface with oil. Take out another sheet, rotate it so the overhanging edges are offset with the first sheet. Brush with the oil. Repeat with four of the remaining sheets. Shred the seventh sheet and scatter across the bottom of the crust. Some great recipes here. I can never have too many black-eyed pea recipes - like the combo of flavor in your salad recipe. And I've got chard coming out my ears at the moment (well, not literally, but my garden has gone crazy with it this year) so I'm always looking for chard ideas. Thanks.